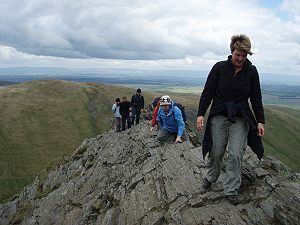 The Keswick Mountain Festival is continuing to be a success bringing visitors into the town to take part in competitive and non-competitive events. 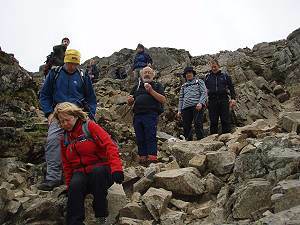 When you are not walking enjoy the Adventure Base on Crowe Park as well as the varied talks and other evening entertainment. This was the first year with a dedicated camp site and live music on Crowe Park in the evenings. Here are the walks Skye and I went on. 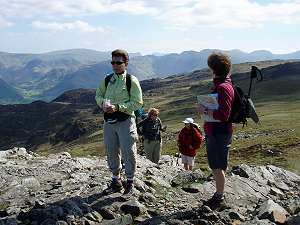 On Friday we enjoyed a delightful walk on the west side of Grasmere but with views across to Langdale too.Taking a well used path from Grasmere up the Easedale Valley we climbed by waterfalls to Easedale Tarn where in Victorian days you could buy a cup of tea! On a smaller path now (with helpful stepping stones across the boggy bits) we strolled along above the tarn and then climbed a rocky path eventually reaching a broad and grassy ridge. 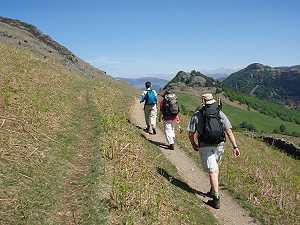 From here it was an undulating walk with superb views 12km distance with 650m ascent. 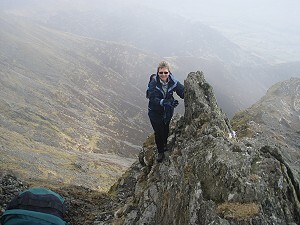 On Saturday we climbed Blencathra by my favourite route. 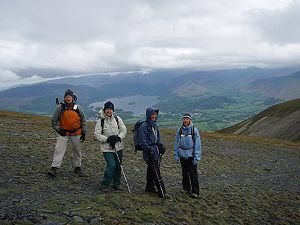 We met outside the White Horse Inn in Scales from where we walked round the base of Blencathra to reach the start of Halls Fell Ridge. 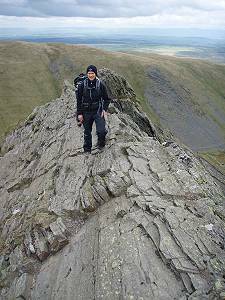 This route gives about half a mile of fairly continuous scrambling on a knife edge ridge (mostly avoidable if you must!) bringing you out right on the summit. From here we passed the white stone crosses on the way to Atkinson Pike and peeped over the edge at Sharp Edge before exploring Bannerdale Crags and returning to Scales. 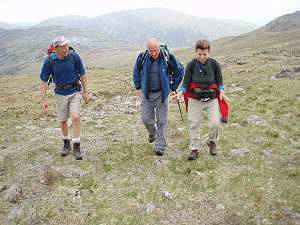 Distance is about 10km with 850m ascent. 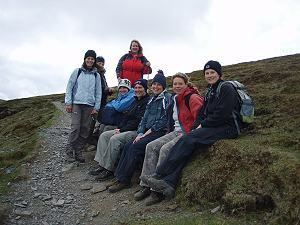 Sunday saw us climbing steeply through woods above Stonethwaite mainly on a stone laid path. Grassy paths followed leading to Bessyboot above Tarn at Leaves. 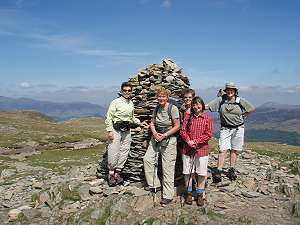 With views in all directions the walk to Glaramara was a delight wending between rocky outcrops and tiny tarns with hardly any other walkers using this approach. 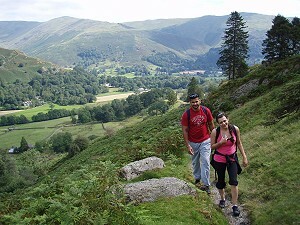 Our descent was by way of Thorneythwaite Fell on a more frequented path. Distance about 13km and 850m ascent. 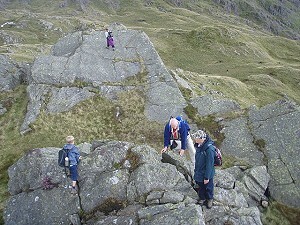 Visitors had the opportunity to try a wide range of outdoor activities from walking to climbing;scrambling to photography; kayaking to gill scrambling. 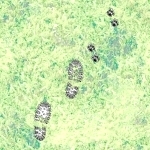 You could learn more about the history of the area with mine walks and stone wall building or practice with map and compass or go Geocaching. 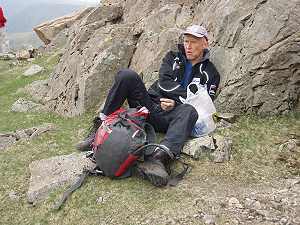 There was the chance to compete in the first Keswick Triathlon, cycle Trail Quest or the Lattrigg fell race. In addition there were plenty of talks and films about mountaineers and other adventurers in this country and abroad. We all enjoyed hearing from Julia Bradbury about producing the Wainright TV series on the Lakeland Fells. In fact there was something for everyone! 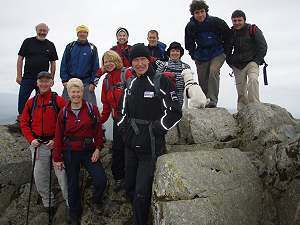 all of us on the summit of Great Gable. 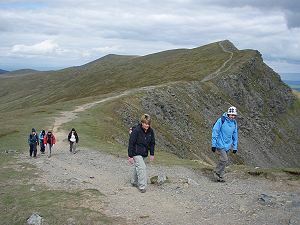 On Saturday I led a Ladies only walk sponsored by Asolo up Skiddaw with a free pair of boots for one lucky participant. 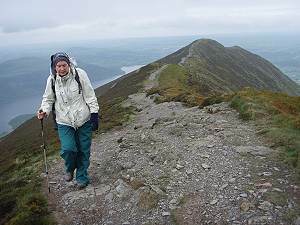 We took the bus round to Mirehouse and after walking through Dodd Wood we climbed to Carlside Tarn by way of Ullock Pike and Longside Edge - one of my favourite ways to climb Skiddaw. By now it was cool, breezy and misty with no shelter for lunch! 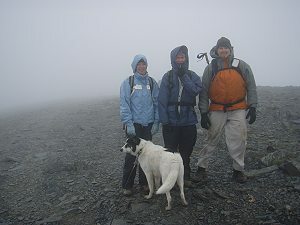 By the time we reached the summit there was a strong wind and thick cloud. We descended rapidly back to Carlside and down to Mikllbeck. A pleasant ramble through the fields back to Keswick concluded the day. 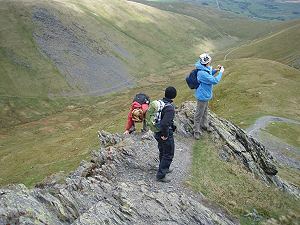 Sharp Edge - carefully does it! striding along the top of the Edge!